It goes worse and worse. I can only hope that every US-citizen stand up against this treating. It's ridiculous, inefficient, inhuman and a direct hit on your freedom rights. Head over to the article by Robert Graham to read more. 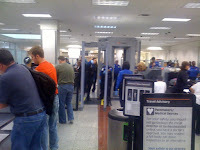 Errata Security: I was just detained by the TSA: "Today, I was detained by the TSA for about 30 minutes for taking pictures while going through security. Taking pictures is perfectly legal. I took pictures of the 'advanced imaging' machines that see through your clothes – the machines that are the subject of so much controversy lately. I was quickly besieged by TSA agents shouting at me to stop taking pictures. I was then detained while they tried to figure out what to do with me."